41st Anniversary Sale. 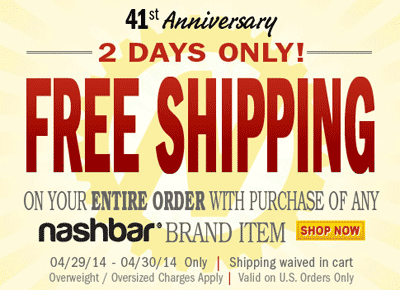 Free Shipping on any $41+ order. Expires on 05/13/2014. Take an extra 15% off entire order+ Free Shipping Orders $15+. Expires on 04/16/2014. Founded in 1973, Nashbar offers a wide array of cycling products and accessories for both athletes and hobbyists. Nashbar spends their time searching for the best values on quality closeouts, overstocks, discontinued items and exclusive models in the name of getting you the best deals on earth. In addition, they also make their own line of products under their brand name. Shop for the appropriate clothing, shoes and protective gear. You can also find items for nutrition and hydration, lights, tools, bike parts and more. Join their email list to stay in the know about the latest “steals and deals.” They also carry a 100% satisfaction guarantee promotion as well as one to match any deals you might find elsewhere.